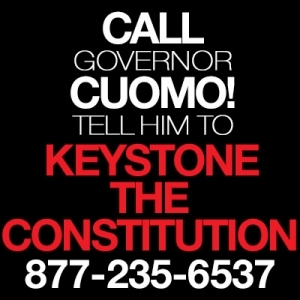 On May 6, 2015, the DEC published a notice in the Oneonta Daily Star that said the deadline for comments regarding permits for the “Constitution” pipeline would be 15 days from the date of that publication – meaning May 21st. Pressed by the STP Steering Committee, the DEC sent a confirmation by email that the deadline for submitting comments to the DEC is now May 21, not May 14. Comments submitted during the first comment period which ended February 27, 2015 will be considered as DEC reviews the permit application. Use the form below to tell the DEC to protect New York State water quality by denying the 401 water quality certificate. Click the plus or minus sign to open or close the talking points below. DEC should protect New York State water quality by denying the 401 water quality certificate. Please write or paste comments above. Recommended comment length is 300 words per submission. Yes, the pipeline is targeted for my property. No, but my property is adjacent. No, but this pipeline will directly impact all our lives negatively. DEC must ensure the information is complete and integrated, and then let the public comment. The New York State Department of Environmental Conservation (DEC) should share all new information with the public regarding the proposed “Constitution” pipeline, and reopen the comment period once the joint application is complete. On April 29, 2015, the DEC announced a new fifteen-day public comment period (which will end on May 14, 2015), stating the Constitution Pipeline Company (Company) had withdrawn and resubmitted the same application for the 401 water quality certificate. No new information was provided to the public. However, the Company has been conducting surveys since the application was last updated, in August 2014, and has been sharing information with the DEC. In addition, the Company recently gained access to over one hundred parcels of land, and is now gathering even more information about the streams, wetlands and species on those parcels. All of this new information should be included in a revised or supplemental Draft Environmental Impact Statement (DEIS), and integrated into a Final Environmental Impact Statement (FEIS), but so far that has not occurred. The People of New York State are entitled to have access to all information being exchanged between the Company and the DEC. How can we make meaningful comments on an application if vital information is not shared with the public? I ask the DEC to ensure there is a complete DEIS and FEIS, and an updated application, with all of the information needed to make findings under SEQR (State Environmental Quality Review Act). I also ask the DEC to reopen the public comment period for an additional sixty days once it has obtained all of the required information from the Company and shared it with the public. Williams fined $388,694 in 2013 — the highest fines of any oil and gas company in the PA. Protect New York State water quality deny the 401 water quality certificate! A 2013 Compliance Report issued by the PA DEP states that Williams, through three pipeline subsidiaries, was charged the most fines of any oil and gas company in the state. 9% of the route for the proposed Constitution Pipeline is through regulated wetlands. Wetlands are critical to protecting water quality. Wetlands, also known as marshes, swamps, and bogs, provide critical habitat for plants, fish, and wildlife uniquely adapted to this environment. Wetlands purify polluted waters and minimize the destruction of floods and storms. Wetlands also provide many recreational opportunities. Wetlands purify water by filtering sediment and absorbing pollutants from surface water. A wetland restoration study in NY shows that only about half of the organic matter had reestablished within 55 years compared to the original wetland. Storage of excess water in wetlands reduces downstream flooding. Later, drought is mitigated in streams as this stored water is slowly released. Wetland vegetation reduces erosion and sedimentation of streams. With inadequate survey information, and lacking a forest management plan, the FEIS fails to accurately predict the expected devastation from wetland destruction and the “mitigation” of relocating wetlands. The Catskills is famous for its trout fishing. The brook trout is our State Fish. CP’s stream crossings, deforestation and massive streamside shade removal—which would cause erosion, siltation and warming of trout habitat—would violate DEC §703.2 Narrative Water Quality Standards as well as §703.3 Water Quality Standards for dissolved oxygen, dissolved solids, color and turbidity (Chapter X, Divisions of Water). CP would clear-cut 1,000 acres of forested land surrounding prime brook trout habitat. CP would permanently remove 100-foot wide swaths of vegetation and tree canopy on either side of 45 trout streams that the pipeline would cross 84 different times. That would be a total of 168,000 feet of streamside clear-cutting—equal to the length of 467 football fields. Trout require cool water because it contains a lot of dissolved oxygen (DO). Without a certain level of DO, trout die. Removal of streamside trees and vegetation exposes streams to sunlight, thus increasing water temperatures and decreasing DO levels. This threatens the ability of trout to live and thrive. If CP’s deforestation raises temperatures in trout streams, it would violate DEC Regulation Chapter X, Divisions of Water, §703.3 regarding DO levels in trout habitat. DEC says it is “working to preserve” the brook trout, New York’s official State Fish. CP would threaten this work by cutting across 45 trout streams 84 different times in NY and clear-cutting 1,000 acres of forested land leading up to and away from those streams. Deforestation causes increased runoff and erosion, which increases turbidity, or muddiness, in streams. Brook trout require clear water because they are sight feeders. Murky, muddy water at any time = starving fish. Turbid, muddy water also contains less dissolved oxygen, which trout need. The results of CP’s deforestation would violate DEC Water Quality Standards for dissolved oxygen, color and turbidity. (Chapter X, Divisions of Water, Part §703.3). 1000 acres of forest would be clear-cut by construction of the Constitution Pipeline (CP). At a distance of 10 feet between trees, 436,000 trees would be destroyed. At a distance of 6 feet between trees, 1.2 million trees would be destroyed. In 9 months of construction, CP would wipe out the efforts of the Million Trees NYC Project which has planted 943,205 trees in NY since 2007. As flooding increases, removing trees that would help mitigate the ravages of flooding flies in the face of the DEC’s stated mission. Removal of trees that filter sediment and other solids from runoff, keeping them out of waterbodies, would negatively impact water quality in NYS. Clear-cutting of 1000 acres of forest by Constitution Pipeline (CP) would leave 100-foot-wide bare corridors leading down to and away from streams and wetlands. Removal of trees’ roots and canopies leaves riparian zones vulnerable to erosion. Trenching and rock blasting required to lay the pipe in these streams and waterbodies will increase runoff and stream turbidity. For the AA, A, B, C, and D streams that comprise the majority of streams CP would cross, DEC specifically regulates against an … “increase in turbidity that will cause a substantial visible contrast to natural conditions” (Chapter X, Divisions of Water, §701.3). Turbidity will inevitably increase as construction of CP adds sediment and other solids to stream beds. 554 banks of rivers, streams, and creeks in NY will be permanently changed by the tree-clearing on 100-foot-wide Rights-of-Way (ROWS) for the Constitution Pipeline (CP). Maintenance of 50-100 feet of trees and vegetation is recommended from the banks of all waterbodies by Cornell Cooperative Extension for landowners, loggers, and timber harvesters. This “streamside management zone” allows water to percolate well, thereby reducing flooding. This zone also slows runoff, and filters sediment and nutrients from the runoff, reducing sedimentation in water bodies. Tree cover shades streams, thereby cooling the water – essential for trout survival. Trees and vegetation stabilize stream banks, reducing erosion. Clearing these ROWS along streams causes runoff and turbidity, threatening the water quality standards established by NYS. According to DEC regulations, turbidity should not be such that it causes a noticeable visible change from normal stream conditions. The FEIS states that streams the pipeline would cross in NY are classified as AA, C, C(T), C(TS) and D.
Construction of the CP would most certainly cause erosion, flooding, and increased turbidity in the waterways it is projected to cross. Between 400,000 and 1.2 million trees would be lost if Constitution Pipeline (CP) clear-cuts 1,000 acres of forested land through four flood-prone counties in NY. Flooding would increase with the loss of root systems, tree canopy, and leaf litter. Increased water velocity on deforested Rights-of-Way (ROWS) would increase turbidity, flow, and suspended, colloidal and settle-able solids in steams, in violation of 6 NYCRR §703.2 Narrative Water Quality Standards. This increase in flooding will bring road-salt, fuel oil, methane gas, barnyard and septic waste, pesticides, fertilizers, and other toxic chemical contamination to our fresh surface waters. The site of the old Amphenol Plant in Sidney threatens downstream communities with hazardous waste contamination unleashed during floods. The area traversed by the proposed Constitution Pipeline (CP) has seen three 100-year floods in less than 10 years. These floods are expected to increase in frequency as acknowledged by the governor, the DEC, and the scientific community. CP will remove 1000 acres of forest, much of it on steep slopes. These consequences of deforestation violate NYS Water Quality Standards, including 6 NYCRR §703.2. Needs assessment for the project was not done by FERC! Iroquois and Tennessee pipelines are congested. This gas would not be used in New York State, and benefits outside of the state cannot be used to counter the economic and environmental damages that would occur here. Some nonbinding franchises with towns along the route have been agreed to, but this gas would be only 0.6% of the total volume of gas being transported, and that’s assuming it is economical to lay pipelines for local delivery, which is questionable. Such a tiny amount of speculative use does not indicate a need for the project. This proposed pipeline is not in the public interest. It is not reasonable to destroy over 1800 acres of land so some companies’ stock prices can rise. Bald Eagle, Osprey, Red-shouldered Hawk, American Bittern, Pied-billed Grebe, and Northern Harrier are located along the pipeline route – and all are listed as at-risk species by the NY State Department of Environmental Conservation. Pipeline activities during breeding season pose a particular threat to birds. Silt fences and properly sized pipes would be cast aside like a joke in such torrents. DEC must protect flooding susceptibility along the entire length of the pipeline as it travels through the Chesapeake Bay watershed. Since there is no way this can possibly be done. Ask DEC to take into account increased carbon emissions from gas infrastructure build-out with its inherent air pollution. Cumulative impact of two pipelines within 100 feet of each other. New York’s water quality laws demand that you do not grant a 401 Permit to the Constitution Pipeline. Fish, esp. baby trout, need a lot of dissolved oxygen in their spawning streams. They also need clear cold water, and will not survive if the water is too turbid (muddy), or too warm. Construction in clay soils on steep slopes will cause a turbid runoff lowering the amount of oxygen in the water and smothering trout eggs in silt. Clear-cutting will warm those trout spawning waters. DEC’s lawful duty is to enforce the Clean Water Act and protect those same standards. Your job mandates protection of New York State water quality.